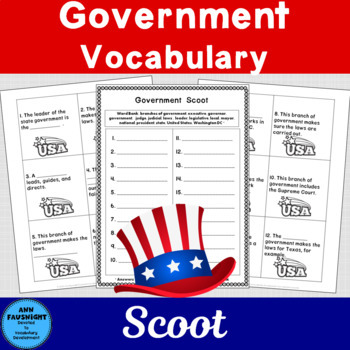 Your students will enjoy finding showing off their knowledge of government vocabulary with this game of Scoot! Great for practice or assessment. 1. Cut out each numbered question card and place one randomly on each student’s desk and/or in other locations around the room. 2. 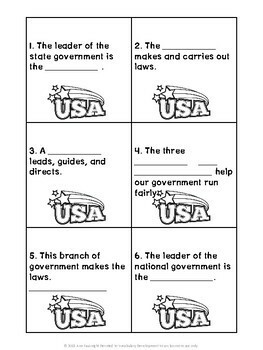 Copy the answer sheet and give one to each student. 3. 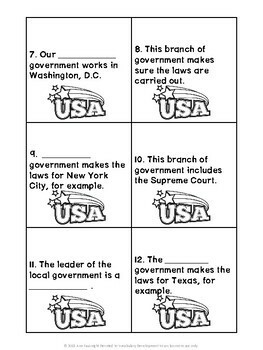 Each student starts at an assigned spot and answers that question. 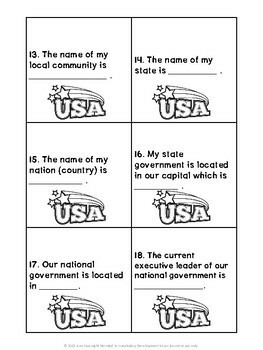 Be sure students record the response on the answer sheet by the correct space! Everyone cannot start at one! 5. The students continue moving along the route of the game until they have answered every question and have returned to their original spot. • Follow my store for product updates and sales. • Follow my Facebook page to find occasional flash freebies and ½ price sales on new products here. • Please leave feedback to gain credit for future purchases.